The differences between typical western argenteus from the U.K. and northern Scandinavian argentatus is rather straightforward on primary pattern P5-P10. However, there is a gradient and overlap in features of birds from populations in northern Germany, Denmark and southern Norway. Identification is even more challenging in birds from Baltic populations, which show both characteristics of argenteus and argentatus, but sometimes also of the southern taxa michahellis and particularly cachinnans. Adult birds from the western populations argenteus show more black in the outer primaries, compared to northern argentatus. In argenteus, P5 normally shows small black sub-terminal markings, concentrated on the outer-web as a clear-cut black angular spot and in some birds extending on the inner-web as a diffuse streak. There may be some black on P4 as well, although this might be a clue for near-adult birds. In argentatus, especially from far northern Scandinavia, the black marking on P5 is completely lacking or is very limited and diffuse. Argenteus often has a black sub-terminal band on the top of P10, dividing the tip from the mirror. If the black sub-terminal band on P10 is broken, there is often still black on the inner and outer-web's edge of P10. Normally argentatus lacks sub-terminal markings on the outer-web of P10. Baltic argentatus often have the black marking on P5 confined to the outer-web as a single rectangular small black square, with well-defined borders (not diffuse as in most Finnmark birds). In most Baltic birds, the white tip of P10 fully merges with the mirror, without a single sign of a sub-terminal band. The greyish-white 'tongue' on the inner-web is often broad and continues far down P10, almost creating a thayeri pattern on P10. 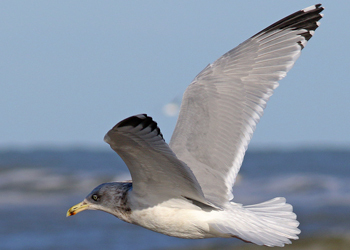 The shape of the division line between greyish tongue and black outer-web can be an identification clue: In cachinnans this division line often makes a strong angular curve and has a smooth straight line, unlike the pattern of Herring Gulls, which often show a "saw-blade" motive or otherwise much irregularities along the division line. Sometimes wear of the outer primaries may be useful as a first indication of origin: An early moulting species as cachinnans on average show more abrasion in the feathers than later moulting argentatus. Extensive research on the P10 pattern of Scandinavian argentatus was done for Norwegian birds by the Norwegian ornithologist Edvard Barth, and is presented in the table below. Table 4 from E.K. Barth, The circumpolar systematics of Larus argentatus and Larus fuscus with special reference to the Norwegian populations, 1968. 200 Norwegian birds. (Notation converted to what we use in the texts, MM). 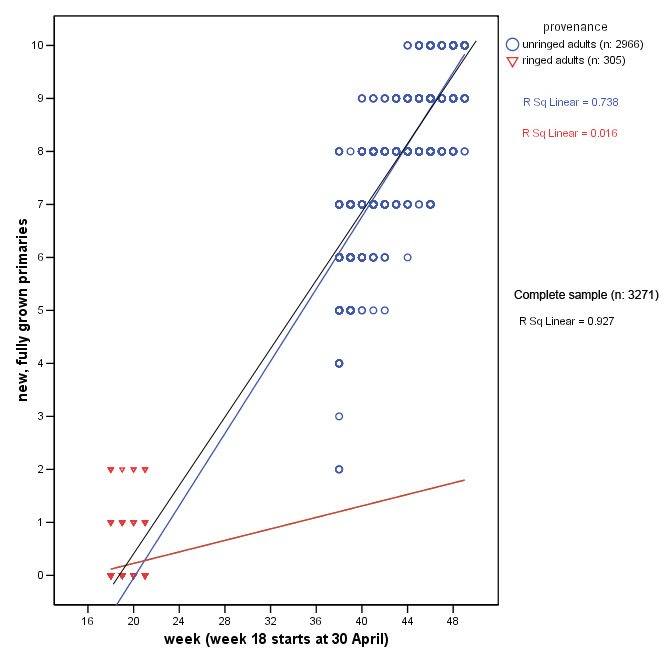 Especially birds from north Scandinavian Finnmark may show the characteristic 'thayeri' pattern in the outer primaries P9 and P10 (column 5 of tip pattern P9 in the table). This pattern is named after the Thayer's Gull, which often shows a particular pattern in the outer primaries: the mirror and the white tip merge and are connected to the pale inner-web (see this image). In other words: the black medial band of the outer-web doesn't fully reach the edge of the inner-web and there is no sub-terminal band. In Thayer's Gull this pattern may be very obvious and, together with the 'string of pearls' may be indicative for identification. 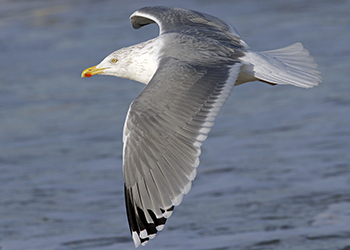 By October the majority of adult Lesser Black-backed Gulls moulting the outer primaries. There is a clear difference between presumed birds lingering around and birds which will probably migrate further south quickly. The difference can be found in the primary moult strategy. 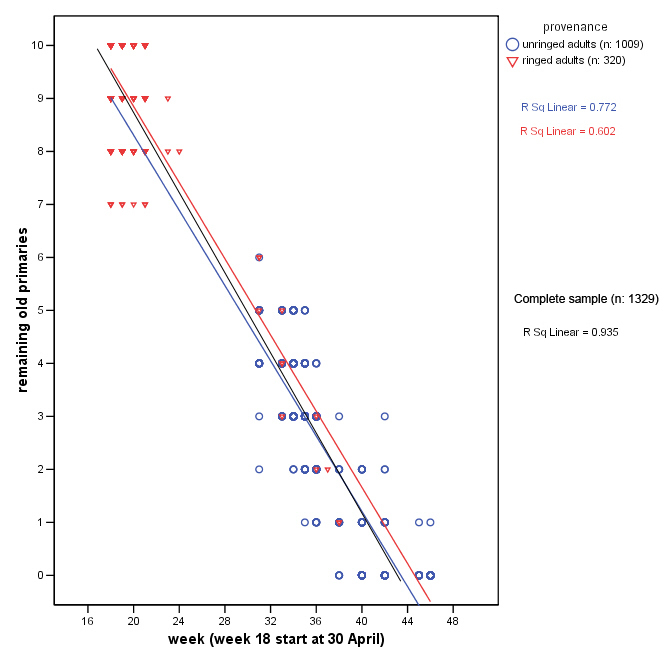 Some adult have a large moulting gap in the central primaries (for example P8-P10 old and only P4 fully grown and P5 still slightly shorter than P4) by the first days of September. It is hard to believe these birds will travel large distances non-stop as such moult gaps are highly inefficient for this migration pattern. Probably these birds, which can be found moulting in a period roughly from late August to late November stay in the area throughout their primary moult. They migrate further south either forced by cold winter or when the primaries moult arrives at the far outer primaries. The other group is represented by birds with a very small moult gap in the primaries or with a very low primary moult score, indicating that primary moult will probably suspended until arrival at the wintering grounds. Table above, data for the Netherlands (2000-2010), results for spring & summer (aggregated week): number of new, fully grown primaries in adults. Herring Gull 0731 15+cy, January 31 2014, Boulogne-sur-Mer, France. Picture: J-M Sauvage. Herring Gull D1RT sub-adult, January 18 2019, Katwijk, the Netherlands. Herring Gull argenteus BTO GR75240 adult, January 03 2019, Noordwijk, the Netherlands. Herring Gull (argenteus) CPAX 2CY-7CY, 2009-2014, Calais, NW France. Picture: Jean-Michel Sauvage. Herring Gull (argenteus) CYAZ 2CY-5CY, January 2010 - January 2013, Koksijde, Belgium. Picture: Peter Adriaens. Herring Gull (argenteus) FKAK 15CY-16CY, December 2011 - November 2012, Koksijde, Belgium. Picture: Peter Adriaens. Herring Gull (argenteus) FPAH adult, January 10 2011, Koksijde, Belgium. Picture: Peter Adriaens. Herring Gull (argenteus) FVAT 5CY (4th cycle), January 03 2010, De Panne, Belgium. Picture: Peter Adriaens. Herring Gull (argenteus) FXAP 5CY & 7CY, March 10 2011 & January 10 2013, Blaringhem, France. Picture: Harry J.P. Vercruijsse. Herring Gull (argenteus) GCAM adult, January 2010 & January-February 2012, Koksijde - De Panne, Belgium. Picture: Peter Adriaens. Herring Gull (argenteus) KNAT adult, May 2010 & January - February 2012, Belgium. Picture: Peter Adriaens. Herring Gull (argenteus) KTAD adult, January 03 2010, Koksijde, Belgium. Picture: Peter Adriaens. Herring Gull (argenteus) 4CY-5CY MJAU December 2012 & January 2013, Boulogne-sur-Mer, NW France. Picture: Jean-Michel Sauvage. Herring Gull (argenteus) MMAK adult, January 10 - March 10 2011, Koksijde, Belgium. Picture: Peter Adriaens. Herring Gull (argenteus) SBAJ 8CY, January - November 2012, Koksijde, Belgium. Picture: Peter Adriaens. Herring Gull (argenteus) BLB H-66866 October 2003, January 2011 & August 2016, Brouwersdam, the Netherlands. Herring Gull H-88093 18-19cy (argenteus), 2010-2012, IJmuiden, the Netherlands. Herring Gull L-99798 11-12cy (argenteus), 2011-2012, IJmuiden, the Netherlands. Herring Gull (argenteus) H-147125 8CY & 11CY-12CY, 2012 & 2015-2016, IJmuiden, the Netherlands. Herring Gull (argenteus) BLB H152381 adult, September 20 2011 & January 31 2016, Westkapelle, the Netherlands. Herring Gull Y.AAK adult (argenteus), January 08 2009, IJmuiden, the Netherlands. Herring Gull Y.AKS adult (argenteus), January 29 2010, IJmuiden, the Netherlands. Herring Gull Y.AFM adult (argenteus), January 29 2010, IJmuiden, the Netherlands. Herring Gull argenteus Y.BKC adult, January 03 2019, Noordwijk, the Netherlands. Herring Gull argenteus Y.BRC adult, January 03 2019, Noordwijk, the Netherlands. Herring Gull argenteus Y.BUH adult, January 03 2019, Noordwijk, the Netherlands. Herring Gull (argenteus) Y.CAV adult, September 2016 - January 2019, IJmuiden - Katwijk, the Netherlands. 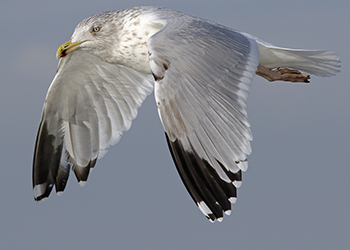 Herring Gull (argenteus) Y.CHH adult, May 2017 - January 2019, Heemskerk, Noordwijk & Scheveningen, the Netherlands. Herring Gull (argenteus) PCHC 11CY, January & May 2017, Scheveningen, the Netherlands. Herring Gull F.ABD adult (argenteus), January 01 2012, Katwijk, the Netherlands. Herring Gull (argenteus) FANK adult, January 29 2014, Katwijk, the Netherlands. 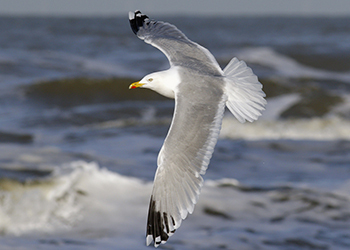 Herring Gull (argenteus) FASD adult, December 2015 - February 2016 & January 2018, Noordwijkerhout-Katwijk, the Netherlands. Herring Gull argenteus M.AWV adult, January 03 2019, Noordwijk, the Netherlands. Herring Gull (argenteus) K.BKX 6CY, January 18 2019, Katwijk, the Netherlands. Herring Gull (argenteus) T Y 24CY, January 10 2011, Koksijde, Belgium. Picture: Peter Adriaens. Herring Gull (argenteus) A L 29th cycle (30CY), January 17 2015, IJmuiden, the Netherlands. Picture: Maarten van Kleinwee. Herring Gull A||6 adult, January 20 2017, Scheveningen, the Netherlands. Herring Gull argenteus C||0 adult, January 03 2019, Noordwijk, the Netherlands. Herring Gull argenteus D||V adult, January 03 2019, Noordwijk, the Netherlands.he Netherlands. Herring Gull (argenteus) 1CY-7CY 5W November 2007 - June 2013, Boulogne-sur-Mer, France. Picture: J-M Sauvage. Herring Gull (argenteus) 8M 4CY-5CY (3rd & 4th cycle), April 2011 & January 2012, Koksijde, Belgium. Picture: Peter Adriaens. Herring Gull (argenteus) UT 7CY, January - August 2014, Dordrecht, the Netherlands. Picture: Theo Muusse & Merijn Loeve. Herring Gull (argenteus) FC 5CY, January 24 2017, Scheveningen, the Netherlands. Herring Gull (argenteus) V4 adult, January 20 2017, Scheveningen, the Netherlands. Herring Gull (argenteus) 1.3 adult, January 24 2017, Scheveningen, the Netherlands. Herring Gull (argenteus) 1.J adult, January 23 2017, Scheveningen, the Netherlands. Herring Gull (argenteus) J.T adult, January 23 2017, Scheveningen, the Netherlands. Herring Gull (argenteus) L.P 1CY, 2CY, 3CY, 5CY, September 17 2013 - January 2017, Katwijk - Scheveningen, the Netherlands. Herring Gull (argenteus) N.H adult, May 2015, September 2016 & January 2019, Katwijk, the Netherlands. Picture: Merijn Loeve & Mars Muusse. Herring Gull (argenteus) X.1 2CY & 5CY, December 2014 & January 2017, Noordwijk & Scheveningen, the Netherlands. Herring Gull argenteus L.D 7CY, January 28 2017, Scheveningen, the Netherlands. Herring Gull (argenteus) RR 2CY & 6CY, November 2010 & January 2014, Dordrecht, the Netherlands. Herring Gull (argenteus) KF 7CY, January 20 2017, Scheveningen, the Netherlands. Herring Gull (argenteus) NLA 6.177.408 5CY, January 18 2019, Katwijk, the Netherlands. Herring Gull argenteus NLA 6.166.614 10CY, January 03 2019, Noordwijk, the Netherlands. Herring Gull NLA.5.344.175 12cy (argenteus), January 05 2011, IJmuiden, the Netherlands. 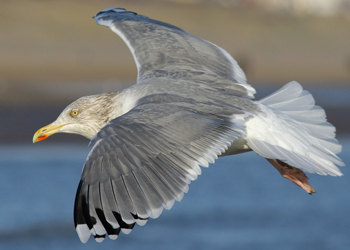 Herring Gull adult (argenteus) NLA 5.343.149 January 2011 & February 2015, IJmuiden, the Netherlands. Herring Gull NLA.5.352.764 7cy (argenteus), January 2009 & 2011, IJmuiden, the Netherlands. Herring Gull NLA.5.352.757 7cy (argenteus), January 08 2009, IJmuiden, the Netherlands. Herring Gull NLA.5.361.182 14+cy (argenteus), January 08 2009, IJmuiden, the Netherlands. Herring Gull 5.414.557 6cy (argenteus), January 2010, Leiden, Netherlands. Herring Gull argenteus H695 adult, January 30 2018, Katwijk, the Netherlands. Herring Gull (argentatus)H16L 2CY & 7CY, January 2012 & 2017, Katwijk & Scheveningen, the Netherlands. Herring Gull adult X994 (argentatus), January 04 2002, Boulogne/Mer, France (50.43N-01.37E). Herring Gull AF54 adult (argentatus), January 26 2008, Westkapelle, the Netherlands. Herring Gull argentatus DKC 4271246 adult, January 03 2019, Noordwijk, the Netherlands. Herring Gull argentatus DKC 4297195 adult, January 28 2017, Scheveningen, the Netherlands. Herring Gull argentatus DKC 4402258 adult, January 03 2019, Noordwijk, the Netherlands. Herring Gull argentatus BTO GG20689 32CY, January 15 2015, Boulogne-sur-Mer, France. Picture: Jean-Michel Sauvage. Herring Gull argentatus J9RZ 2CY & 13CY, November 2007 & January 2018, Westkapelle & Katwijk, the Netherlands. Picture: Pim Wolf & Mars Muusse. 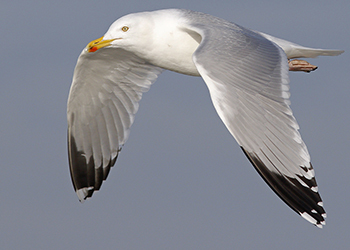 Herring Gull argentatus JGK1 18CY, December 2015 - January 2016, Boulogne-sur-Mer, France. Picture: Jean-Michel Sauvage. Herring Gull argentatus J2316 5CY, January 18 2015, Vest-Agder, Norway. Picture: Nils Helge Lorentzen. Herring Gull (argentatus) J2393 4th cycle (5CY), January 14 2015, Scheveningen, the Netherlands (52°05'56"N 004°15'56"E). Picture: Wim van Yperen. Herring Gull argentatus J4000 5CY, January 07 2016, Boulogne-sur-Mer, France. Picture: Jean-Michel Sauvage. Herring Gull (argentatus) J8446 adult, January 08 2015, Hovindam - Oslo, Norway. Picture: John Sandøy. Herring Gull (argentatus) JL529 2CY-7CY, March 2014 - January 2019, Leiden-Katwijk, the Netherlands. Picture: Maarten van Kleinwee & Mars Muusse. Herring Gull argentatus JX621 adult, January 27 2015, Boulogne-sur-Mer, France. Picture: Jean-Michel Sauvage. Herring Gull argentatus NOS 4231547 adult, January 03 2019, Noordwijk, the Netherlands. Herring Gull P054 adult (argentatus), January 16 2004, Lubna rubbish dump, Poland (52°02'N 21°08'E). Herring Gull P066 adult (argentatus), January 14-17 2004, Lubna rubbish dump, Poland (52°02'N 21°08'E). Herring Gull (argentatus) 9LCA 4th cycle (5CY), January 02 2015, Jakuševec landfill, Zagreb, Croatia. Picture: ringing team Luka Jurinovic. Herring Gull C295S 7cy (argentatus), January 12-17 2004, Lubna rubbish dump, Poland (52°02'N 21°08'E). Herring Gull C658 adult (argentatus), January 16 2004, Lubna rubbish dump, Poland (52°02'N 21°08'E). Herring Gull C280 8cy (argentatus), January 13-15 2004, Lubna rubbish dump, Poland (52°02'N 21°08'E). Herring Gull CU37 8cy (argentatus), January 16 2004, Lubna rubbish dump, Poland (52°02'N 21°08'E). Herring Gull 5cy HT-195.171 (argentatus), January 04 2002, Boulogne/Mer, France (50.42N,1.34E). Herring Gull adult KN32 (argentatus) January 06 2013, Terschelling, the Netherlands. Picture: Jacob Jan de Vries. Herring Gull (argentatus) KN80 12CY, January 22 2015, Le Portel, France. Picture: Jean-Michel Sauvage. 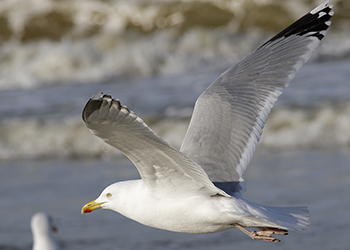 Herring Gull (argentatus) 1CY-8CY KV48 January 11 & February 11 2013, Boulogne, NW France (picture J.M. Sauvage). Herring Gull K756 6cy (argentatus), January 16 2004, Lubna rubbish dump, Poland (52°02'N 21°08'E). Herring Gull (argentatus) RUM ES14360 4CY-7CY, July 2015 - January 2018, Brouwersdam, the Netherlands. Picture: Maarten Sluijter, Ted van der Knaap, Merijn Loeve, Martijn Bot & Mars Muusse. Herring Gull argentatus RUM ES18028 sub-adult, January 30 2018, Katwijk, the Netherlands. Herring Gull (argentatus) RUM C-730262 6CY, January - February 2018, Katwijk, the Netherlands. Herring Gull adult, January 16 2013, Katwijk, the Netherlands. Mirror on P10 separated from white tip by small band. Mirror on P9 restricted to inner-web. Sub-terminal black on P5 only single spot on outer-web. Mirror on P10 merges with tip. Sub-terminal black on P5 absent. Much black in wing-tip (P4-P10) could be indication for argenteus. Mirror on P10 separated from tip (full sub-terminal band). Sub-terminal black on P5 is a single mark on the outer-web. Herring Gull adult, January 23 2013, Katwijk, the Netherlands. Bird with "bajonet" on P8. Most probably nominate argentatus, on head shape. Mirror on P10 merges with white tip. Bird with much black on P5. Mirror on P10 separated from tip. Mirror on P9 bleeds onto outer-web. Full sub-terminal black band on P5. Bird with thayeri pattern on P9-P10. Herring Gull adult (argentatus), January 20 2012, Scheveningen, the Netherlands. Note thayeri pattern. Bird with thayeri pattern on P9. - sub-terminal black on P5 on outer-web only. Medium pale tongue on P10 combined with full sub-terminal band. Bird with long pale tongue on P10 and full sub-terminal band. Small black spot on P5. Probably argenteus, with long pale tongue on P10 and full sub-terminal band. No black on P5. Probably argenteus, with long pale tongue on P10 and broken sub-terminal band. - sub-terminal black on P5 absent. - sub-terminal black on P5 just a well-defined small spot on outer-web. Sometimes sub-terminal black on P10 very diffuse. No black on P5. Large mirrors. - sub-terminal black on P5 concentrated on outer-web. Long pale tongue on P10 combined with full sub-terminal band. Small mirror on P9, mirror absent in left wing. Sub-terminal band on P5. Wing-tip pattern not often found in European Herring Gull. Mirror on P10 separated from tip. Long pale tongue on P10 (almost 'thayeri pattern'). Normally, a long pale tongue is combined with no, or very restricted sub-terminal black. Broken sub-terminal black band on P5. Mirror on P10 separated from tip. Medium pale tongue on P10. Sub-terminal black on P5 only small spot on outer-web. Herring Gull adult, January 06 2012, Katwijk, the Netherlands. Herring Gull adult, January 06 2012, Katwijk, the Netherlands. Late moult? Herring Gull adult, January 20 2012, Noordwijk, the Netherlands. Probably argentatus, with medium pale tongue on P10 and broken sub-terminal band. Probably argentatus, with argenteus behind. Bird with medium pale tongue on P10 and broken sub-terminal band. Bird with short pale tongue on P10 and full sub-terminal band. Bird with 'bubble-gum' pink legs. Herring Gull adult (argentatus), January 06 2012, Katwijk, the Netherlands. Note thayeri pattern. - broken sub-terminal black on P5. Bird with short pale tongue on P10 and broken sub-terminal band. No black spot on P5. Mirrors on P9 and P10 are large. Mirrors on P9 and P10 are very large. Three images to show wing-tip variation in adults. Image to show wing-tip variation in adults. Herring Gull adult, January 20 2017, Scheveningen, the Netherlands. Adult with all dark iris. Herring Gull adult, January 20 2017, Scheveningen, the Netherlands. Still in peimary moult, P8 f.g. Herring Gull adult (argentatus), January 06 1992, Worcestershire, Britain. Picture by Peter Stewart. Note the thayeri pattern. Herring Gull adult (argentatus), January 06 1992, Worcestershire, Britain. Picture by Peter Stewart. Little black on the outer-web of P5. Herring Gull adult (argentatus), January 06 1992, Worcestershire, Britain. Picture by Peter Stewart. No black on P5. Herring Gull adult (argentatus), January 04 2002, Boulogne/Mer, France (50.42N,1.34E). A cachinnans look-alike.